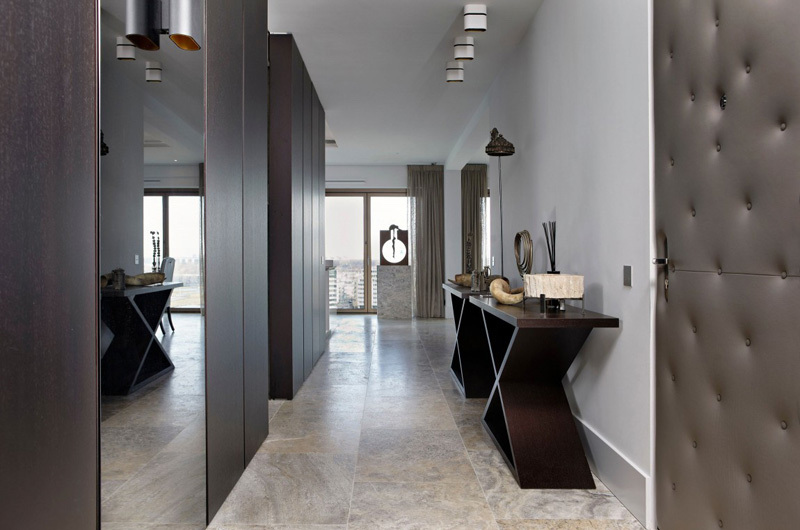 A penthouse has a contrasting interior of white and gray and it used travertine for its flooring and other areas. Why is it that there are people who choose to stay in a penthouse apartment than owning a huge house? Is there a great advantage in staying in a penthouse compare to a large residential house? Today, we can see how the designer responded to the client’s demand of what an excellent example of Jan-Evert’s work is displayed exactly in the interior of a penthouse situated in the center of Amsterdam (The Netherlands). What is special in this apartment is actually highlighted in its interior spaces. 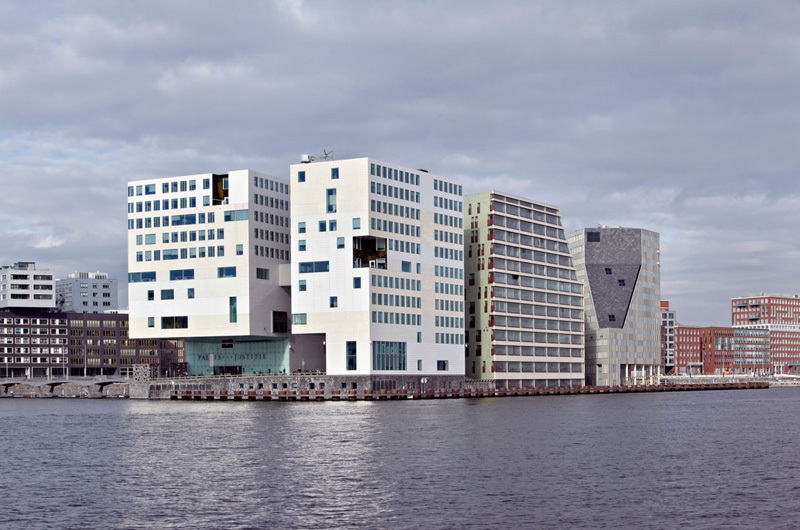 In fact, this penthouse is considered as a home for it was bought as a building shell which is located on the waterfront with an open view of the Film Museum EYE. This is said to be described as a splendid location which requires a special interior design except for the façade and service shafts. Unique feature: The designer shows the unique features of the house through its interior spaces. The consistent use of travertine materials highlighted the extraordinary elements of the house which are seen from its different spaces. 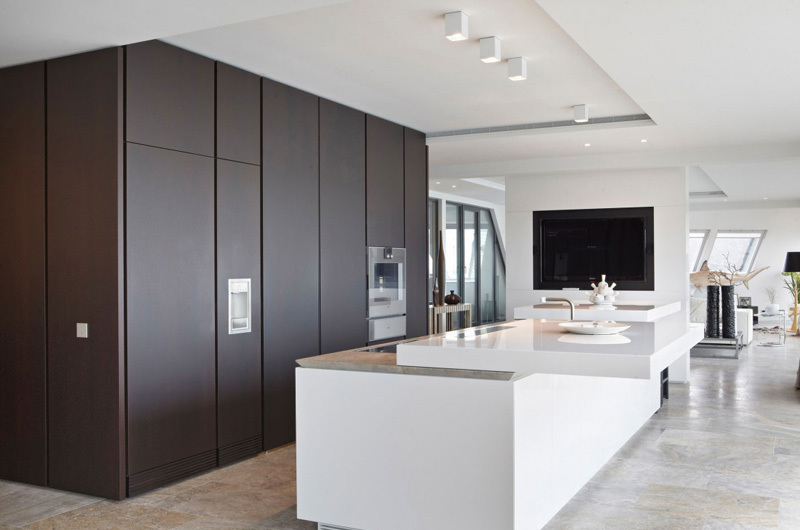 Let us take a look at how the designer manages to design an elegant and luxurious penthouse in this modern building. The oceanic view may be seen from the different parts of the interior of the penthouse. From the entrance, the client may fully see the amazing and stylish furniture well-arranged in every part of the interior. Different forms and shapes are also displayed in the interior. Contrasted textures and colors are seen from the furniture and accessories in the interior spaces. See how the designer utilized these huge cabinets and tables that blended well with the modern fixtures and furniture in this neat kitchen. The color combination emphasized the textures and contrast in the furniture that enhances the look of this kitchen, right? Looking closely at the LED lights arranged at the ceiling of this lovely kitchen harmonized with the white and dark brown color of the cabinets and tables here. 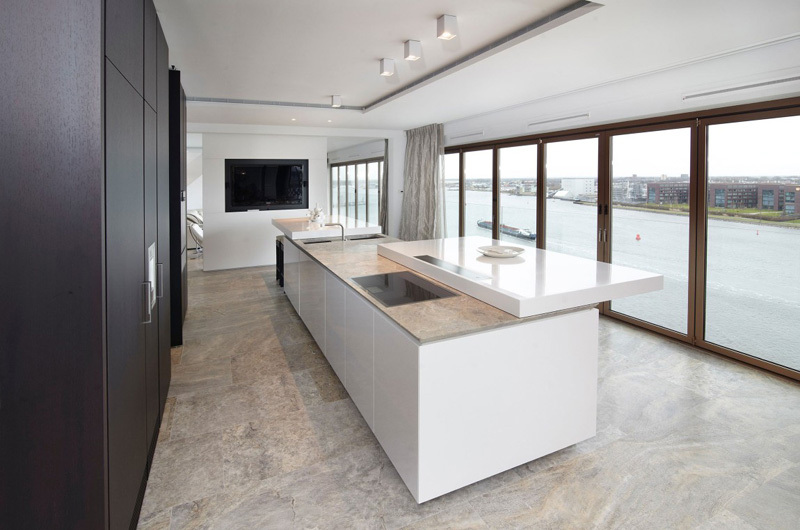 See how the client can truly enjoy the stay in this kitchen where they can take the full advantage of the oceanic view from the glassed walls here. See how the texture of the cabinets and tables in the kitchen sink speaks of true elegance and luxury. Neatness and lovely ideas are also observed here. 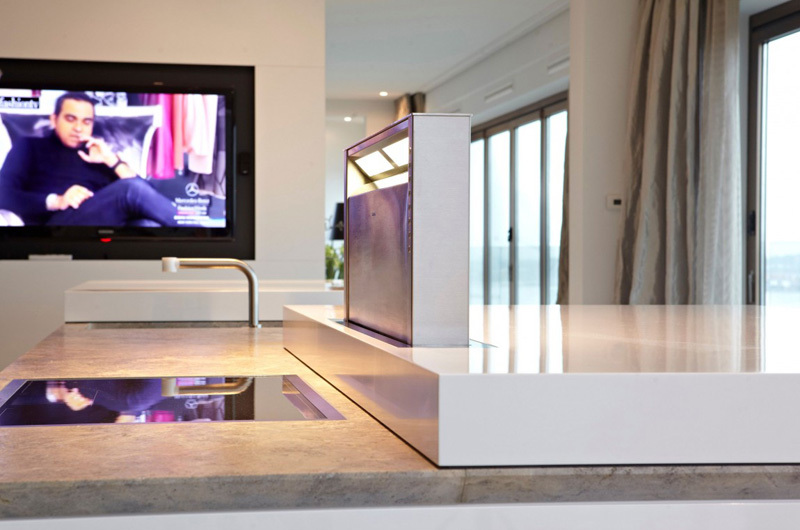 Huge television set is placed near the kitchen so the client can still enjoy her favorite TV show while working or even cooking. 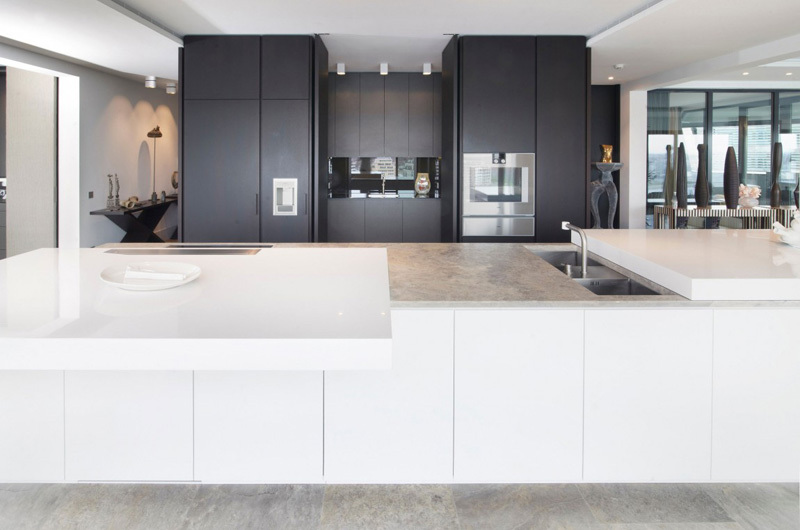 The designer may noticeably utilize the white and black themed palette in the interior that shows the modern and contemporary concept. The ceramic tiles in the dining table harmonized with the floor tiles. A detailed attention to the modern and contemporary style is revealed from the lights installed in the bedroom and the designed pattern of the accessories and furniture here. Great lighting system is very crucial in maintaining the amazing ambiance in this bedroom. Luxury and charm are highlighted in every corner of this space. Ceramic tiles used in this romantic bathroom contrasted the smooth and flawless texture of the walls and fixtures in the powder space and shower area. 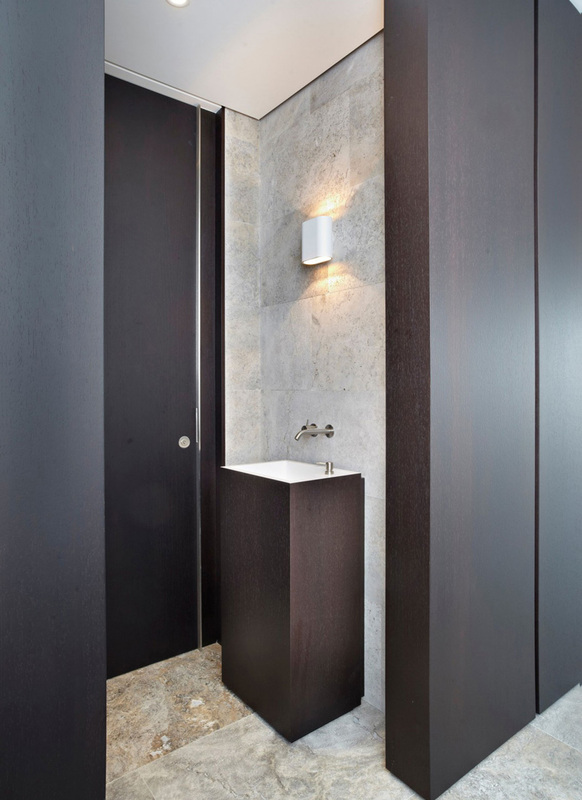 Designated modern fixtures are highlighted with these LED lights installed in the bathroom. The frame used in the kitchen sink complemented well with the walls and floors of the bathroom. 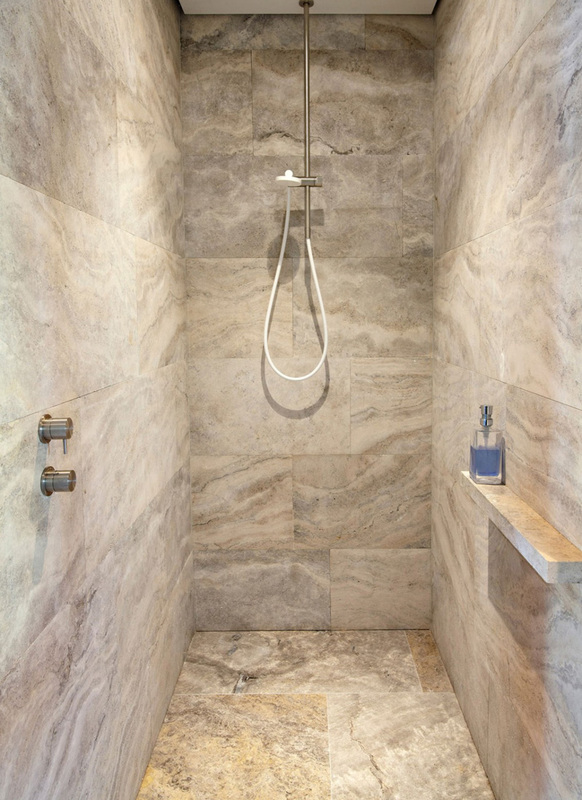 We can definitely see the texture of the ceramic tiles used in the walls of this shower area that shows movement and great style. See the enchanted chandelier that highlighted the charm and beauty of this dressing room. Well-arranged clothing and other accessories of the homeowner is well-displayed here, too. 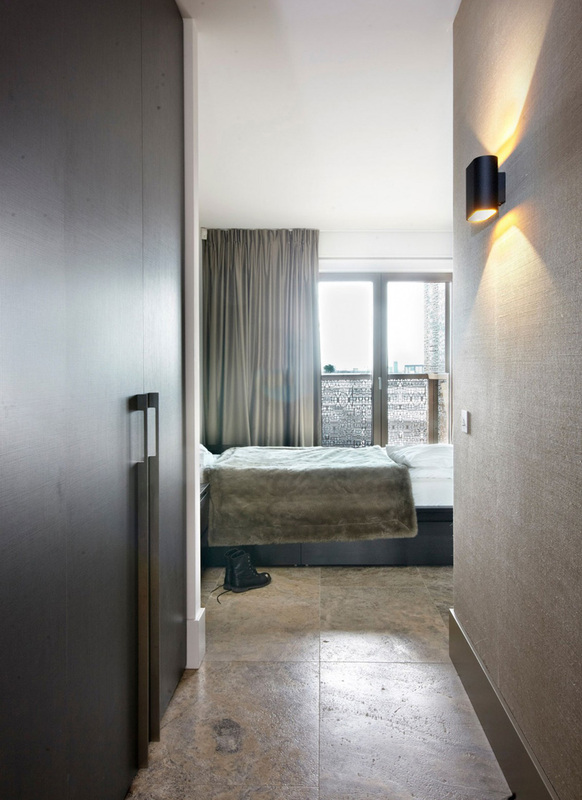 As we can see the above images of the interior of this Penthouse Amsterdam, we may certainly determine how the De Brouwer Binnenwerk utilized their skills and knowledge in making this apartment elegant and comfortable for the owner. The owner may surely feel the real comfort and relaxing space that they are asking for. 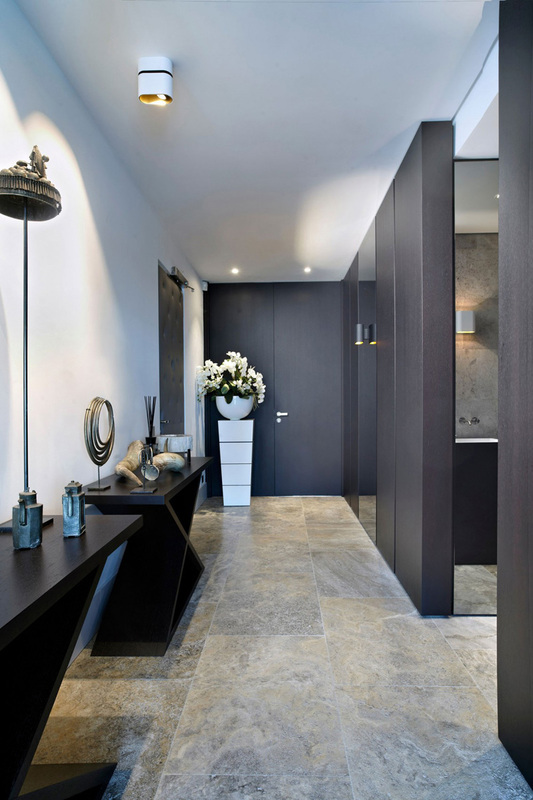 We can also notice how travertine was used on the walls in this alternative way creating a light contrast with the floors which displays an elegant and attractive look. The painstaking attention to details is also reflected, among other things, the choice of the timeless design of the water taps and it forms a perfect match with the travertine. We hope that you have learned new design and ideas today that you may use in your future home.